Dec 13 - Mom's visit in the house. 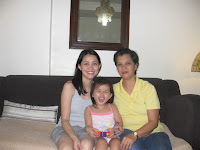 We had lunch & merienda and spent time going around every corner of the house! Dec 20 - Jen & Verl, my lifetime friends since college also visited us and we spent the whole afternoon catching up with each others' stories. The kids enjoyed playing with each other too but I was not able to take a photo of them, all I have are just memories. 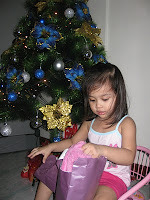 Dec 24 - Christmas Eve, I had Reese open her gifts at 7pm since she was sleepy then. But after that, she got excited and was able to keep herself awake half hour after midnight. Dec 25 - For this year, we spent Christmas in MIL's house. It is a tradition for me and Gani to take turns in spending this day with either of our extended families as we cannot afford to lose half of our day travelling. 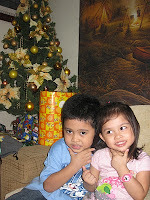 Below is Reese with her cousin Kuya Edlan. Dec 26 - Benedick, Maydee & Nash visited us too. It was so nice of them to find time to be with us during their short vacation in Pinas. Dec 27-29 - Reese was confined in the hospital due to mild pneumonia and an unknown food allergy. She got some cute red rashes on her face as shown in the photos below. Nothing to worry about, she's well and back to her normal self.